In one of the Albion News area rites of spring, athletes from surrounding schools gathered Saturday to compete in the annual Mansfield Invitational track & field meet at the Boone Central athletic complex in Albion. With unseasonably warm temperatures approaching 90 degrees, athletes were able to establish some very solid times and marks in the competition. 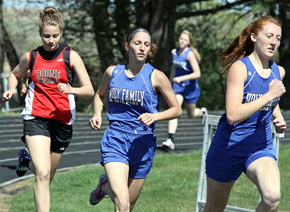 Boone Central won nine girls events in the meet, while Cardinal boys posted seven victories. Lindsay Holy Family had seven winners in girls events and three boys winners. 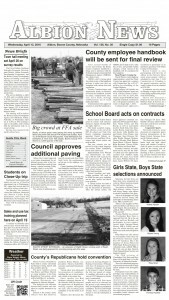 Three Newman Grove boys won events and Spalding/Spalding Academy won one event in girls competition. “We had a great day weather-wise and some very good early season marks,” Boone Central Coach Kris Pestel commented. “The weather was a little warm, but the kids did a great job doing all the things they needed to do to be successful. We were able to put kids in many different individual events to see what they could do against good competition and we faired very well. “The Mansfield meet is a non-scored, unlimited entry meet, so everybody was able to participate in several events. Boone Central had a pair of competitors win two individual events each. Senior Jaime Kennedy captured the 100 (12.8) and 200 (26.8) dashes and sophomore Carter Johnson won the 200 (24.4) and 400 (54.5). Holy Family freshman Catherine Weeder topped all athletes with victories in the triple jump (32’2), high jump (5’1) and 3200 meter run (14:12.4). Others winning twice Saturday were Troy McCuiston of Newman Grove (100 dash, 11.2; long jump, 18’10½), Brayden Frauendorfer of Holy Family (triple jump, 40’11¼; high jump, 6’0), Fullerton’s Curtis Wetovick (800 run, 2:05.2; 1600 run, 4:52.8) and Andrea Weeder of Holy Family (800 run, 2:28.4; 1600 run, 5:30.2). Boone Central boys with single event wins were Michael Lipker (shot put, 42’8½), Blake Slizoski (discus, 123’5) and Nick Paulson (300 meter hurdles, 45.1). Lady Cardinals adding victories were Maria Glidden (shot put, 35’10½), Kattie Cleveland (discus, 119’8), Dana Pelster (pole vault, 7’6), Breann Thorberg (400 dash, 1:05.8) and Olivia Slizoski (300 meter hurdles, 52.3). Boone Central teams won the boys 400 meter relay (45.4) and 1600 meter relay (3:42.7), and Cardinal girls also won the 400 relay (51.7) and 1600 relay (4:20.2).